Earlier this week I posted Sydney lawyer and international affairs analyst David Singer's spotlight on Abu Mazen's UN-bedazzling economy with the truth (it's proving a popular read, so please have a look if you've missed it). And now, here's David's latest article, entitled "Iraq Exacerbates America-Russia Standoff on Destroying Islamic State". America and its 62 nation coalition is becoming increasingly isolated and irrelevant as Russia maintains its airstrikes in Syria and has now commenced firing cruise missiles from warships in the Caspian Sea 1500 kilometres away. Russia is presently contemplating entering Iraq if requested by Iraq’s Prime Minister Haider al-Abadi [pictured above, addressing the UN on 30 September] – who had reportedly indicated last week that he would welcome a Russian bombing campaign to destroy Islamic State’s presence in Iraq. Abadi then said Russian strikes were a “possibility” but had not been discussed. Lavrov’s comment was clearly critical of the American coalition’s air strikes in Syria having being undertaken without any invitation from President Assad – dubiously being justified by America as legal to defend Iraq’s territorial sovereignty against further incursions by Islamic State from Syria. Now just one week later Abadi has upped the ante - reportedly saying he would welcome Russian airstrikes in Iraq if they were coordinated with the American-led coalition and that he sought to maintain cordial relations with both America and Russia. 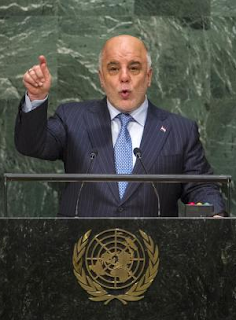 President Obama would not have been very impressed with Abadi’s mean-spirited disparaging comment. The American-led coalition has been bombing Islamic State targets in Iraq for more than a year – but Iraqi officials have repeatedly complained that their efforts are insufficient to decisively turn back Islamic State. The United States has spent more than $25 billion training and equipping Iraq’s military. Iraq’s concern at destroying Islamic State has been heightened following Islamic State claiming responsibility for a series of bombings that killed more than 50 people throughout Iraq on 5 October. constituted armed military force authorized pursuant to a Security Council Resolution under Article 42 of the UN Charter. Obama’s past insistence that any America-Russia co-operation be conditioned upon President Assad’s removal has stymied any possible earlier attempt. “We need to use the United Nations Security Council and believe that preserving law and order in today’s complex and turbulent world is one of the few ways to keep international relations from sliding into chaos. The law is still the law, and we must follow it whether we like it or not. Under current international law, force is permitted only in self-defense or by the decision of the Security Council. Anything else is unacceptable under the United Nations Charter and would constitute an act of aggression." Obama’s failure to test Putin’s sincerity could risk America’s Middle East policy being seriously compromised.